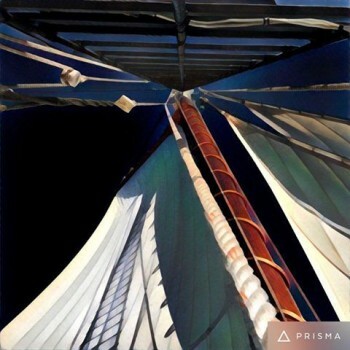 Click to listen to Cape Ann Song! As many of you know, in recent years I have spent a lot of time far from my home port. During one of the longer sojourns abroad, I made the mistake of re-reading the beautiful book Lone Voyager, by Gloucester author Joseph Garland. It tells the extraordinary story of Howard Blackburn, a dory fisherman out of Gloucester who, after losing his mother ship in a snow squall, ended up also losing his dory mate and both of his hands while rowing for his life through the storm. He eventually made it to shore, and slowly made his way back to Gloucester. Incredibly enough, this was just the beginning of his illustrious career on the high seas: despite having lost his hands, Blackburn went on to sail solo across the Atlantic (multiple times); he sailed down the U.S. east coast, around the tip of South America, and back up the west coast to Alaska for an ill-fated stint in the gold rush (though that time he had a crew); and he also sailed solo up the Hudson River, across the Great Lakes, and as far down the Mississippi as he could – until his hull got stuck in the mud. An inspiring, salty soul, to say the least. I say that reading Lone Voyager while traveling was a mistake because, well, it made me incredibly homesick. Images of that stunning, uniquely-New England light over the Atlantic peppered my dreams; I would wake up to imaginary gull cries, or fog horns echoing over invisible harbors. 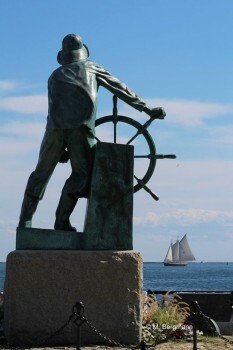 Beyond the rich maritime history of the place, its rich artistic history haunted me as well: the poems of T.S. Eliot drifted through my mind, and mingled with the dreamy Luminism of Fitz Henry Lane and Winslow Homer, or the stark realism of Edward Hopper. So many have passed through this port, and have been inspired to work, to dream, to create. This is more than an island, I thought. And so, around that phrase, a song was born: my humble tribute to a place I am honored to call home. Nel mio piccolo (in my little way), I hope it does the place some semblance of justice. As ever, I am so grateful to my fellow musicians and collaborators in realizing this song – and grateful to you for listening, for reading, for writing, for showing your support in so many ways. Thank you. I will be headed home again in August (! ), and will be booking/posting gigs around New England soon. I cannot wait to see & sing to you. In the meantime, I hope you enjoy this little taste of home, sent from afar. 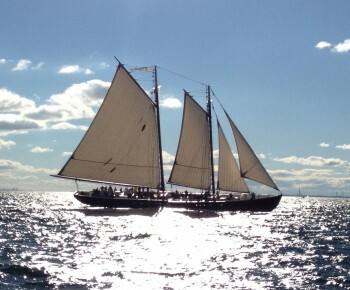 Concert & Sail Aboard the Schooner Adventure! 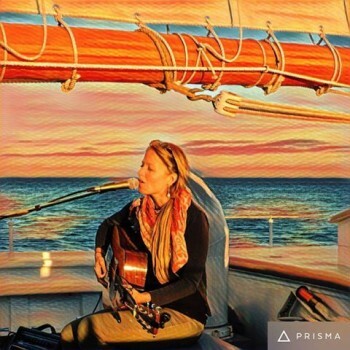 Nearly one year after their wedding on her decks, Marina & Bernardo are thrilled to return aboard the historic Schooner Adventure to perform an intimate, sunset concert as she cruises around beautiful Gloucester harbor! The concert will be held on Sunday, August 23 on a late afternoon cruise, from 3-6pm. Tickets are $60 for non-members, and $45 for members; click here to visit the Adventure’s site to learn more & reserve your tickets. This is a rare opportunity to hear local, original music aboard one of the country’s last surviving fishing schooners! Called “the last of the Gloucestermen,” Adventure is the last remaining fishing schooner built in Essex, MA that features the unique, blunt bow of a working ship adapted to navigating a crowded harbor. After a 20+ year and multi-million dollar renovation, 2015 marks the first summer that Adventure has sailed in decades — a truly momentous moment, and a major feat for the non-profit organization dedicated to the ship’s restoration and upkeep. 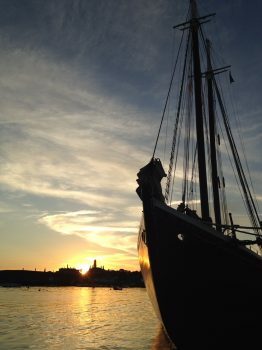 Come celebrate Gloucester’s heritage with a cruise aboard the historic Adventure, accompanied by original music by two of the island’s acclaimed young musicians. Come “see how she scoons”!